According to the Occupational Health & Safety Administration (OSHA), fires and explosions cost homes and businesses more than $2.3 billion in property damage each year. Early detection and verification are the keys to limiting fire loss. 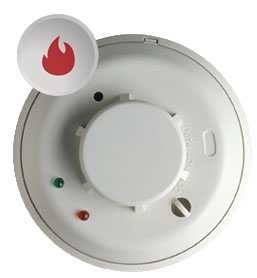 Shiver Security Systems fire detection can be easily integrated with other Shiver products and services. Shiver Security Systems local Central Station operators can monitor signals from your home 24 hours a day. They can monitor smoke and heat detectors. Our professionals can differentiate between an intrusion alarm and a fire signal. They can promptly dispatch the proper emergency response to your home. When a fire is detected, Our Shiver Security local 24 hour monitoring center promptly dispatches local emergency response to keep your family and pets safe. Whether you need ongoing service we can meet all your fire needs.